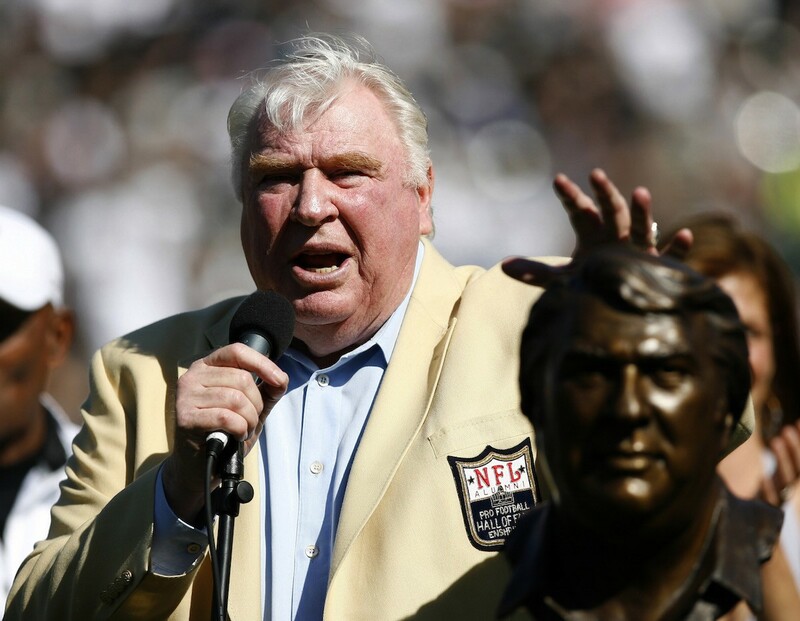 The name "John Madden" and football go together like peanut butter and jelly, spaghetti and meatballs, or any other perfect pair you can imagine. And since its release in 1988, the Madden video game series has been one of the most successful sports game franchises of all time. Madden has sold more than 100 million copies to date and has influenced both players and coaches alike. It's been lucrative for fans, too – Madden tournaments are hosted around the country, pitting virtual quarterbacks against each other. Can you picture a world in which the Madden name wasn't attached to EA Sports' football product? Believe it or not, it nearly happened. John Madden Football was released on MS-DOS, Apple II, and both the Commodore 64 and Commodore 128 systems in 1988. Unlike present-day versions that feature a player on the cover, the initial Madden offering had Madden himself bursting through a chalkboard, holding a football and looking like the camera just caught him in the middle of saying his signature "Boom!" It's glorious. Players couldn't do an entire season in this first game, only single contests. And because EA Sports didn't have an NFL or NFLPA license, the game didn't feature any actual MVP teams, though users could create a brand new squad from scratch. After skipping a season in 1989, EA Sports has released a Madden game every year since. 1991 was when the company started tacking on a year to each title, with Madden '92 hitting stores. Real teams finally started appearing in Madden NFL '94, and real players were introduced in Madden NFL '95. That year was also the first handheld version of the game, making an appearance on both Game Boy and Game Gear. The following year was the first time gamers could create a player. At the turn of the century, Madden NFL 2000 was the first game to be released for both Windows and Mac systems, though it would be the last Mac title until 2008. In 2001, Madden started featuring current NFL players on the cover. Eddie George was the debut athlete to make an appearance, and was also the first player to fall victim to the "Madden curse." The curse has been well documented, with players like Michael Vick being featured on the cover (in the 2004 version) and then missing several or all of the games due to an injury or having a poor season the following year. Subsequent versions have introduced both popular and hated Madden features like the Truck Stick, the QB vision cone, and the Connected Careers mode. Back in 2004, EA Sports was feeling threatened by 2K Sports' ESPN NFL 2K5 video game, so they signed an exclusive license with the NFL and the NFLPI (National Football League Players Incorporated). This deak gave EA Sports exclusive rights to use the NFL's teams, stadiums, and players in a video game, and prevents other companies from making official NFL video games. The deal was reportedly worth $300 million. It's been widely criticized, since it's virtually the definition of a monopoly. Around the same time, perhaps in an effort to start fresh with their newly one-of-a-kind (and the only kind) franchise, EA debated the idea of dropping the name "Madden" from all future games. Perhaps as a cost saving measure, perhaps because they just didn't think the name was necessary. In the end, the honchos at EA decided the Madden name wasn't worth dropping after all. In fact, someone must have decided the name was pretty crucial because they went back to John and started negotiating. When it was all said and done, EA ended up paying John Madden $150 million for the right to use his name and likeness in their game in perpetuity. As part of the deal, he also is paid $2 to $3 million every year as a retainer. Madden retired from lending his voice to both real-life and video game broadcasts in 2009, he still has quite a bit of input in his video games. And he should with the amount of money EA Sports is paying him! Now if we could only find some way to win a virtual turducken… maybe in Madden '17.